There is something about the sea that draws me to it. We live 500m from the beach, and if we go away in South Africa, we usually go to a coastal town along the Garden Route. We have explored the beaches from right up the West Coast all the way along to Natal. My favourite stop is the Wilderness, where the sea really sings and the dolphins play. Our April holiday is always spent going to Europe. We are doing one city at a time, exploring and getting to see the ancient buildings and ruins. We have been to many interesting cities, but each visit is punctuated by a trip to the sea. We have explored the Mediterranean from the west coast to the east coast of Italy and come very close to it in France. We have made sure to take a day out when in Rome to head to the sea, and spent an entire holiday up and down the coastal region of Brittany. This pasta is inspired from the regional products of these areas and Spain – a country still on our list of places to go. Delicious. I can just use french chippolatas!!! I love the access to ingredients you have! Oh I LOVE the flavours here! Hubby would go nuts for this as he is a pasta fiend! If there’s pasta in the title of a post, I’m all excited!! 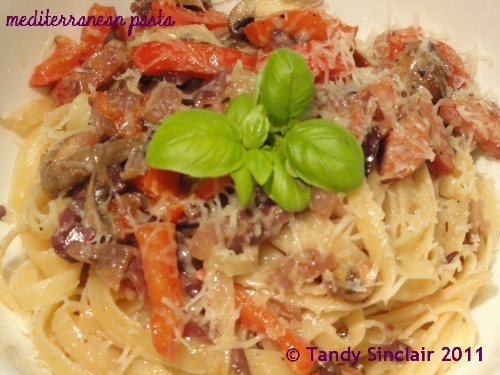 This is a wonderful combination using the sausage and olives….not to mention cream! All my favorites for a big comforting pasta bowl! What a wonderful pasta dish, Tandy! Some of my favorite ingredients. Your April trip sounds like a blast…can’t wait to hear all about it! Nice trips Tandy and the pasta looks great…perfect for a weekday dinner. The place you live sounds beautiful. This recipe looks great too. I love Mediterannean flavors and ingredients. They make such simple but delicious pasta sauces. I’m jealous of your fabulous yearly European vacation! we are never going to retire – we need to work to go away! Looks delicious, Tandy. Spain and Morocco are definitely such interesting places for a foodie like yourself to visit. Your trips sound wonderful, as does the pasta. Thanks for sharing with Presto Pasta Nights. We had a lovely holiday in Spain a few years ago, gee not long till you are off on your travels!